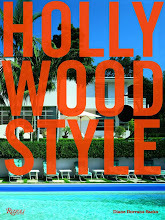 This week THE STYLE SALONISTE goes to sun-struck Palm Springs. I am handing over this week’s new story to the blog’s art director, Brian Dittmar. 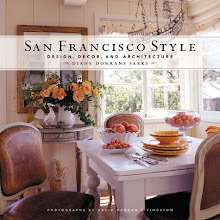 Brian is the art director for THE STYLE SALONISTE, and in his professional life he is an interior designer with a highly successful practice in San Francisco. 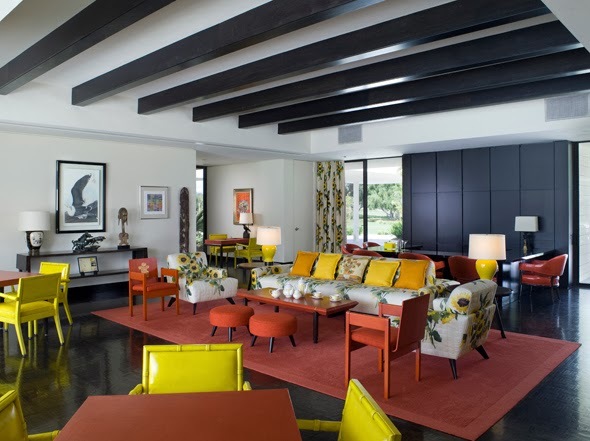 Brian recently completed a fresh new updated interior for a Palm Springs residence, and we want to share it with you. 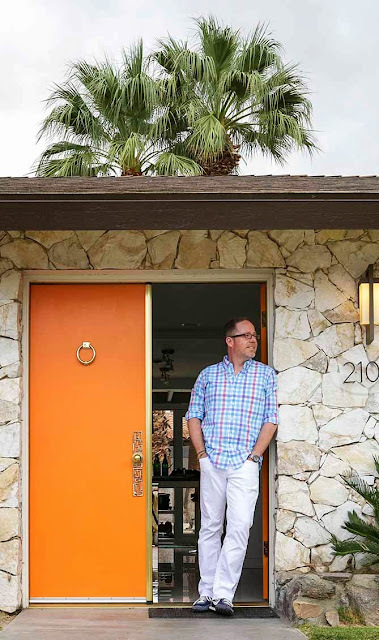 Come with Brian for a trip to Palm Springs—and along the way learn his sources, his design tips, and his top picks of design resources and some of his favorite places to shop and explore in the desert. 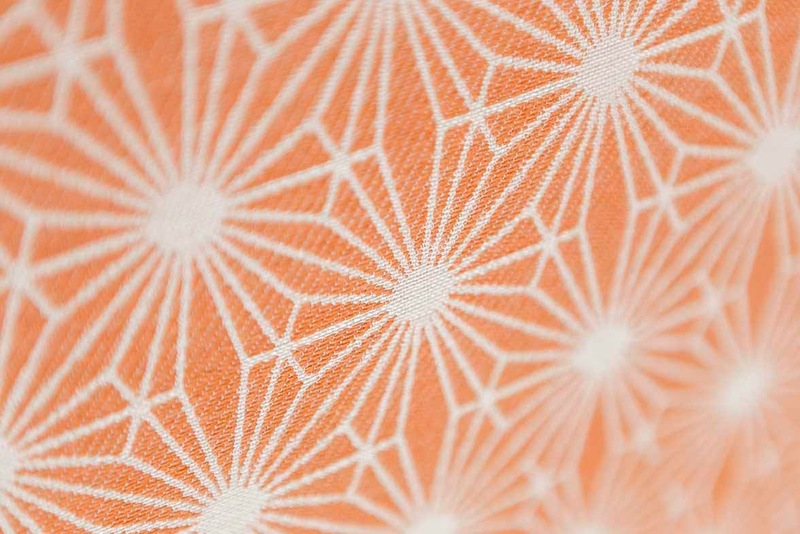 I’ll see you soon—and in the meantime, enjoy the Palm Springs fizz and sparkle. 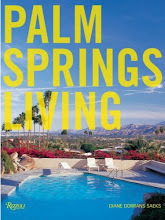 Hello, Brian Dittmar here to welcome you to Palm Springs. 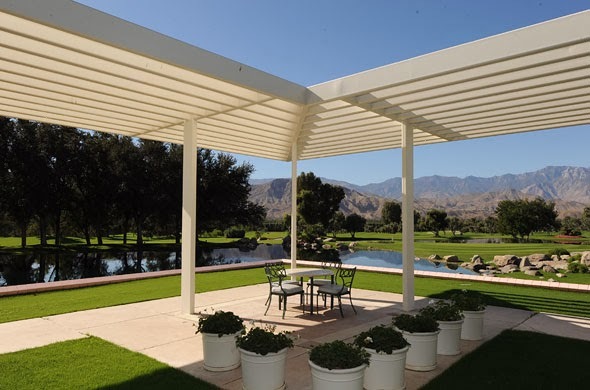 I recently completed a vacation house in Palm Springs for clients from Northern California. 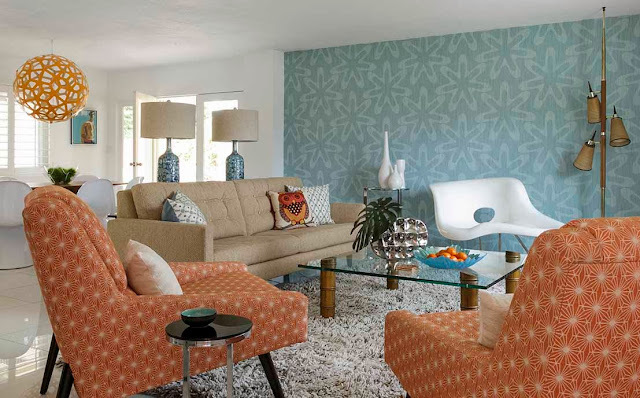 I had worked on their house in the Rockridge area of Oakland several years before and I jumped at the chance to work with these clients again on their getaway home in this relaxing desert destination known for sun, resort living and all things mid-century modern. Welcome to the "Atomic Tiki" house, as I named it — one of the last residences built by the Alexander Construction Company in the Golf Club Estates section of South Palm Springs. 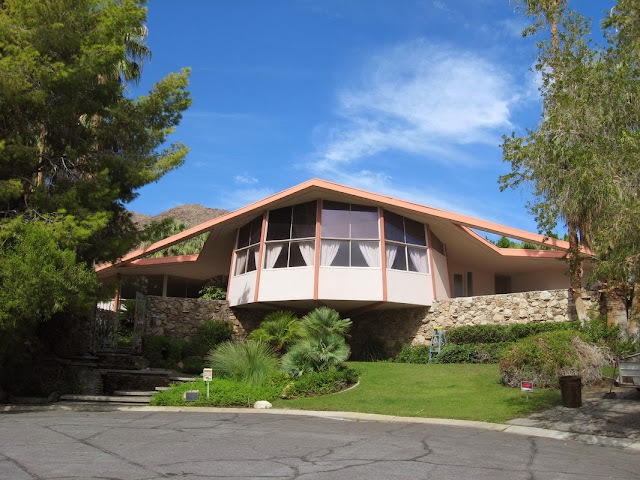 The house was built in 1965 and has an unusual Polynesian-style roofline with a mid-century interior. The 1960s were the peak of the Polynesian pop culture craze in the US and many of the Alexanders’ last houses reflected that influence. Most notably, the roofline of this residence — known as a “Dickey Roof” after the architect Charles W. Dickey (1871-1942) who created this unique “Hawaiian Style” design inspired by King Kamehameha V's grass beach house in Waikiki. It is a double pitch roof, with the top portion of the roof at a steeper angle than the lower portion of the roof. The simplicity of its design — evocative of effortless island living — is synonymous with Hawaiian architecture. 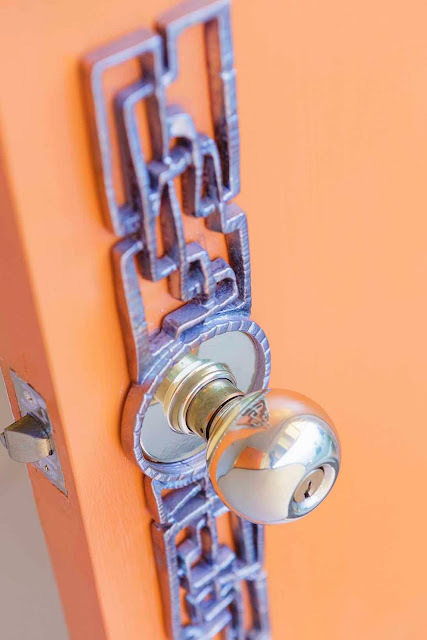 The couple, who are adventure-travellers and love deep sea diving in far-off locations in the South Pacific and Central America, found this ranch house after an extensive search. 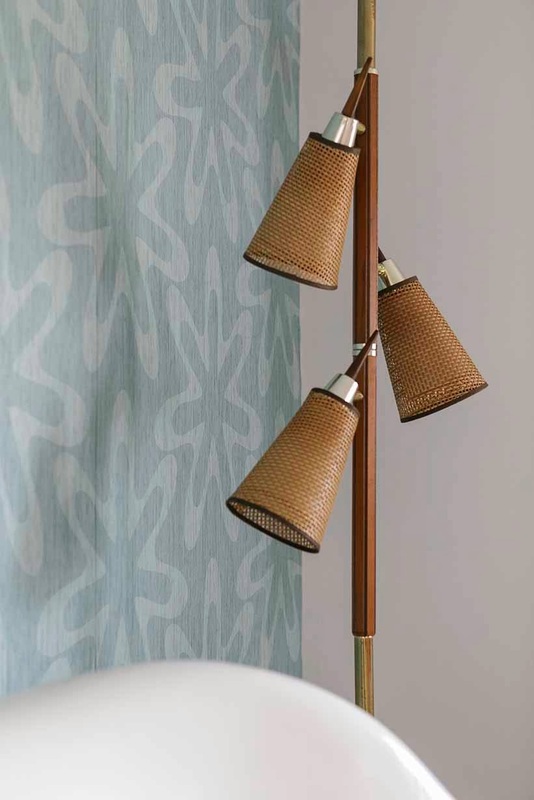 They admired the unusual combination of mid-century design with some Tiki-inspired exterior accents. The house was a diamond in the rough. 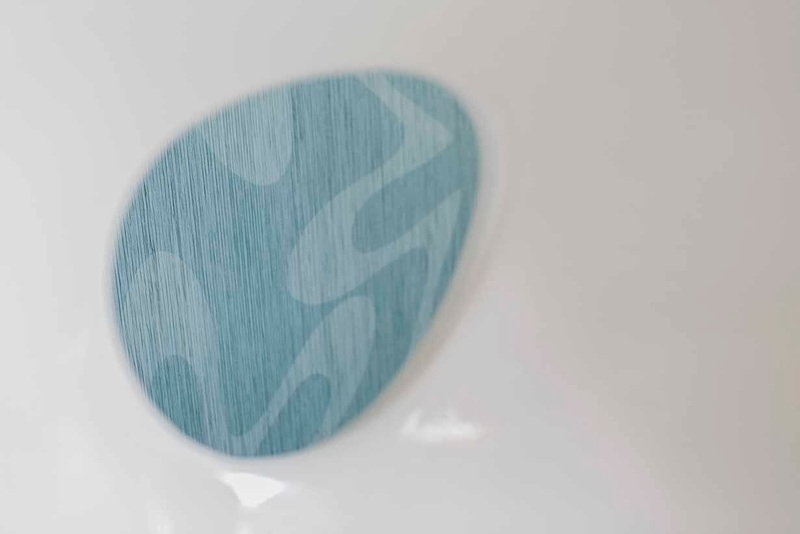 It had not been updated much over the years and was in need of a design transformation to make it look fresh and current. My design brief was to make carefully considered, artful and subtle changes that would refresh the interiors while keeping the residence’s original vibe through a mix of mid-century furnishings and pieces with subtle Polynesian references. Inspiration came in the form of a Tiki head. 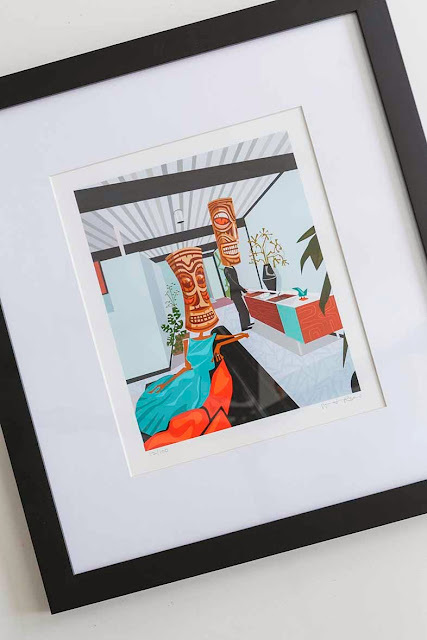 More specifically, “Post and Beam Totems” by Los Angeles-based artist Nat Reed (www.natreed.com) who renders iconic mid-century photography in brightly colored silkscreens, often replacing the human heads with Tiki heads. 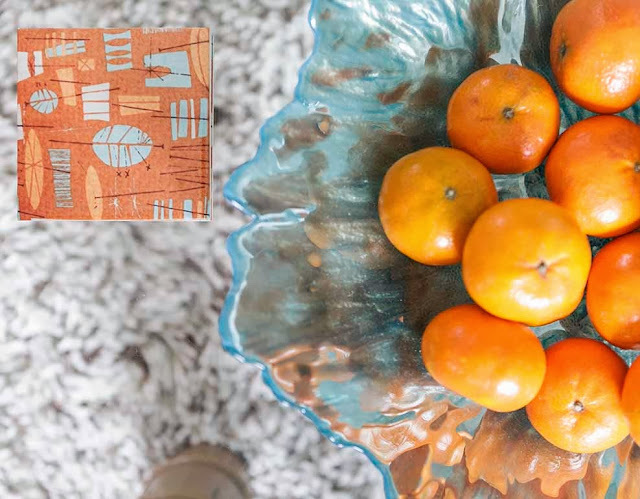 This piece (shown above) was inspired by the great Los Angeles photographer of modernism, Julius Shulman, and hangs in the entry area where it sets a playful yet polished tone for the rest of the house. The original photograph (from which Nat Reed was inspired to create his “Post and Beam Totems”) by Julius Shulman titled "Wonderland Park: 1958". 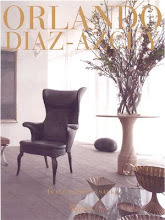 Living Room: Custom chairs and tufted sofa by Brian Dittmar Design are covered in contract-grade fabrics by Kravet (ideal as this is also a vacation rental property). The accent wall is covered in Omexco’s boomerang print grasscloth. 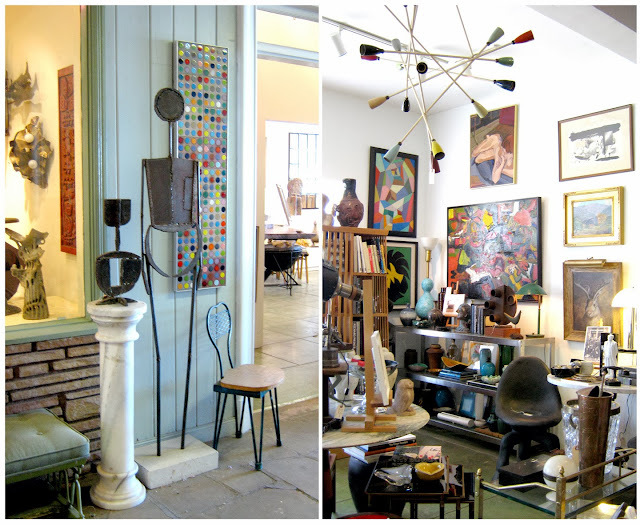 The tension lamp (found on ebay) and the chunky bamboo glass coffee table (found at Misty's Consignments, www.mistysconsignments.com) are both vintage; the white molded fiberglass chaise is a reproduction Charles and Ray Eames ‘La Chaise’. 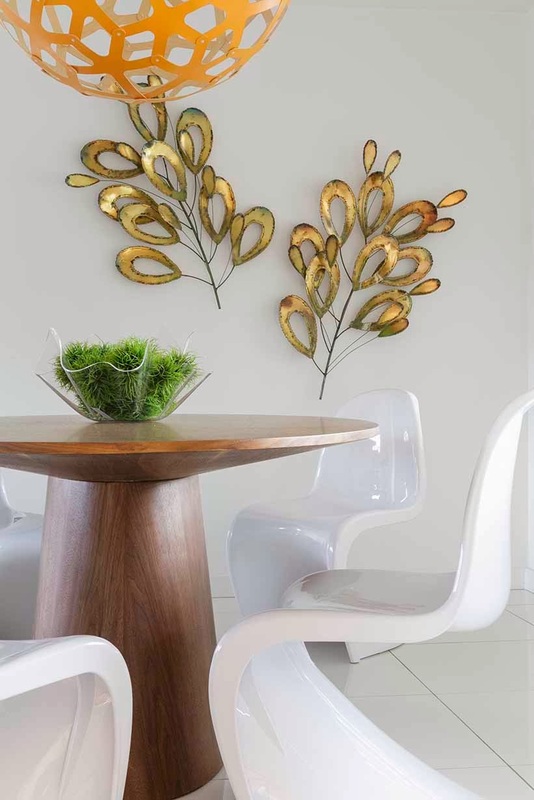 Dining Room: The walnut pedestal dining table is from AllModern.com surrounded by Verner Panton molded plastic chairs in white. 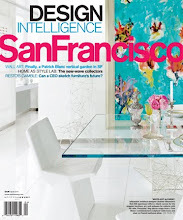 The chandelier is the "Coral" pendant by David Turbridge. Metal wall hanging is vintage Curtis Jeré found at Misty’s Consignments (www.mistysconsignments.com). 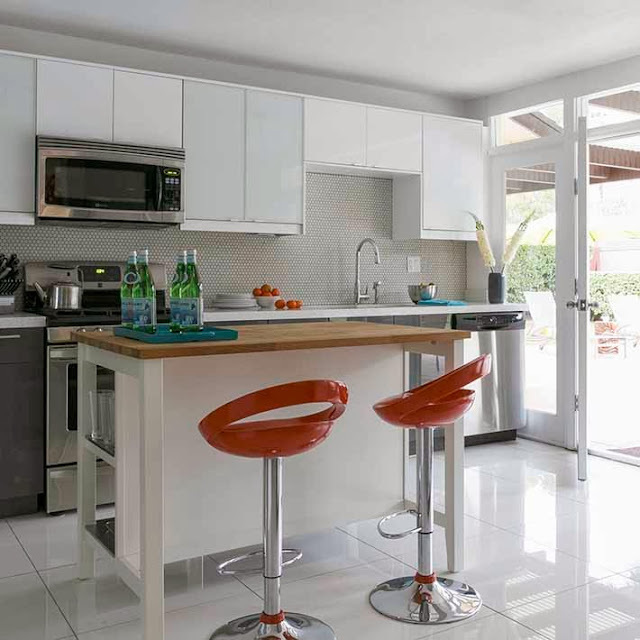 Kitchen: The kitchen's former maple IKEA cabinets were given a new look with new IKEA high-gloss white and frosted glass doors (uppers) and high gloss charcoal gray doors (base). New white quartz countertops are by Caesarstone and replaced very dated pink and black granite; white penny-round tile on the backsplash and shimmering high-gloss white porcelain floor tile (installed throughout the house) are both from Bedrosians. The stools are vintage and were found at The Estate Sale, Palm Springs (www.theestatesaleco.com). The butcher block island is from IKEA. Master Bedroom: The ivory tufted leather headboard and mirrored nightstands, from West Elm, sit in front of a wall covered in Romo wallpaper. Glass lamps with orange streaks are by Arteriors. 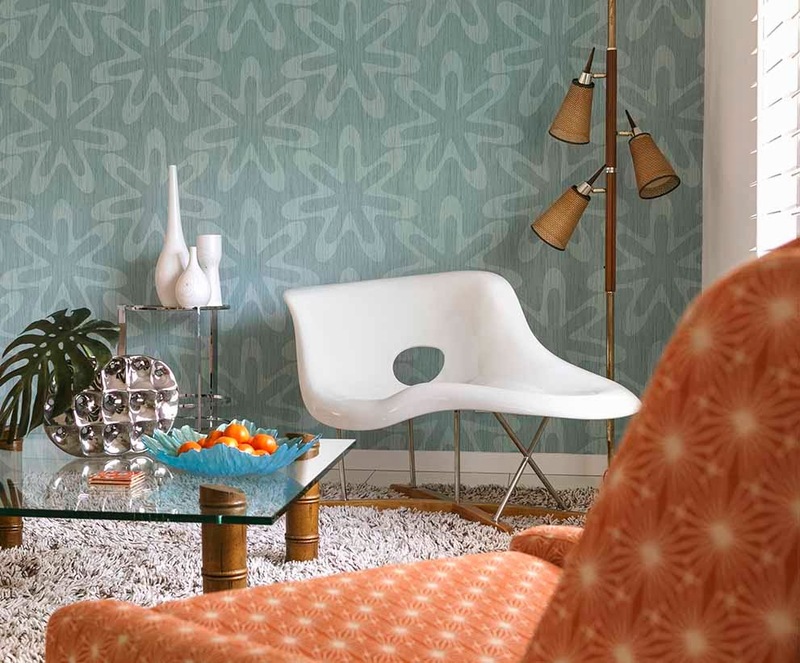 An Arne Jacobsen Egg Chair in orange leather is in the corner. 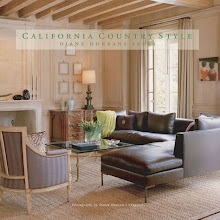 Ivory linen ripplefold curtains are custom by Brian Dittmar Design. 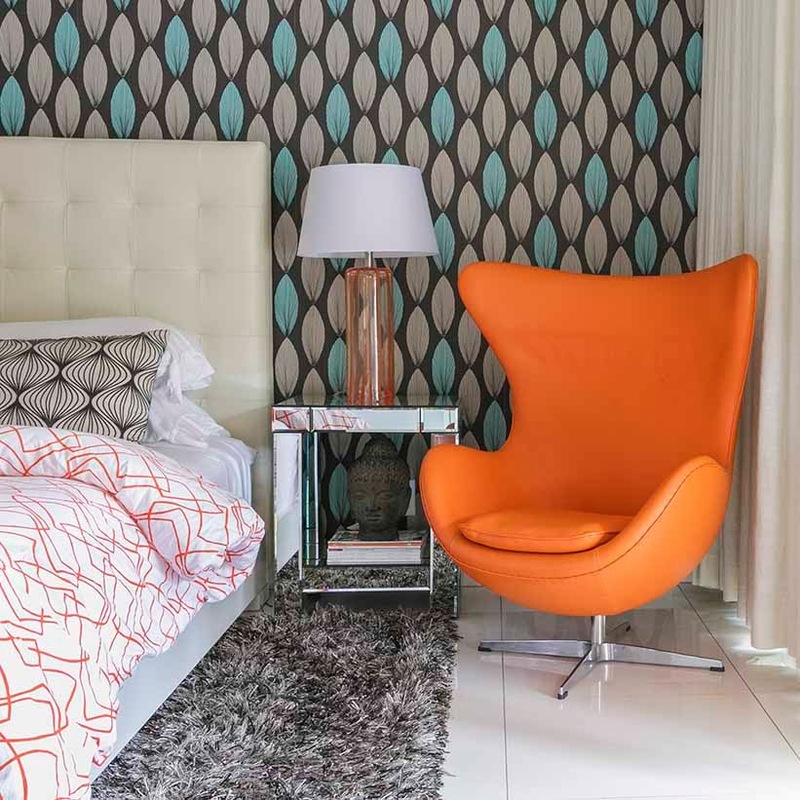 A heathered charcoal gray shag rug and the orange squiggle bedding are both from CB2. The mid-century dresser is by West Elm with a sunburst mirror and crackle glazed lamp from Arteriors. 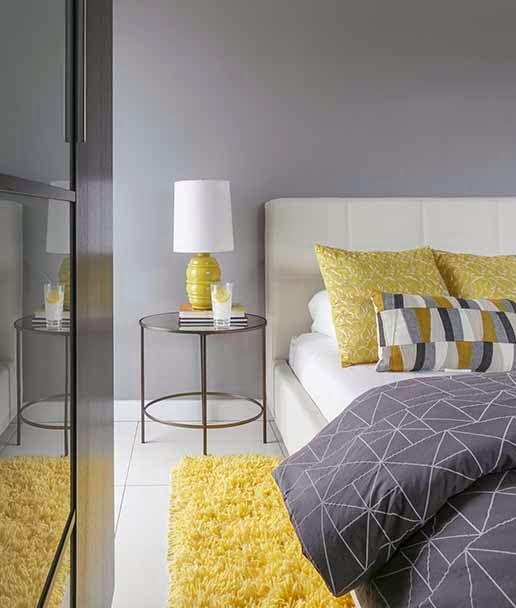 Bedroom 2: The ivory upholstered bed, by IKEA, is flanked by mirrored metal tables from West Elm and canary yellow ceramic lamps by Arteriors. Gray and white geometric bedding and a slate blue dresser are from CB2. 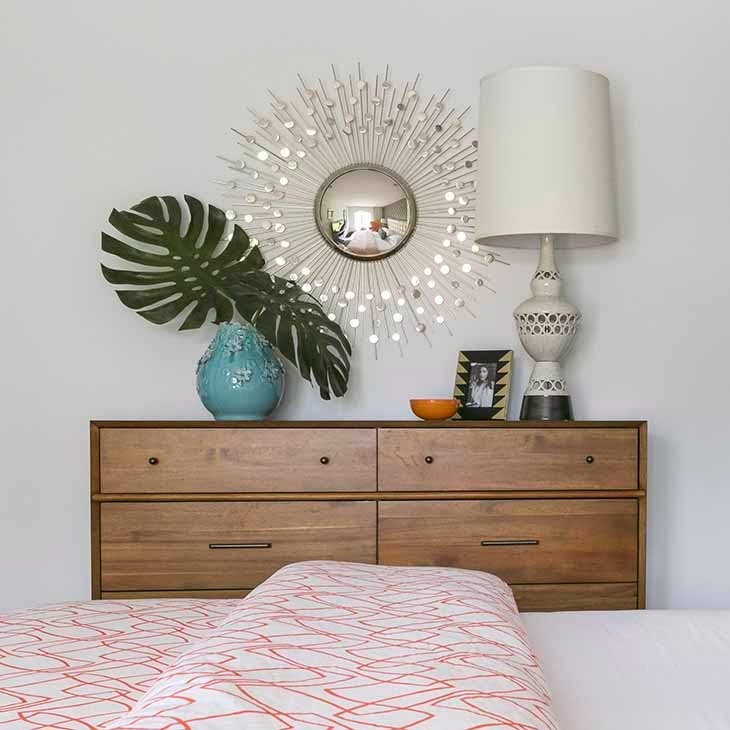 On the dresser, the perforated polished nickel lamp is from Arteriors and the framed photo of Rock Hudson and the mirror are vintage and were found at The Estate Sale, Palm Springs (www.theestatesaleco.com). 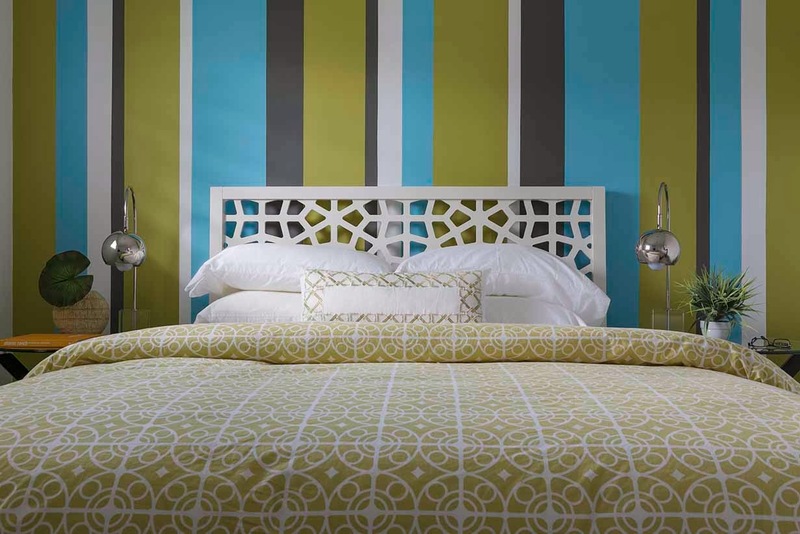 Bedroom 3: In front of the custom painted striped accent wall by Brian Dittmar Design sits a Moroccan-inspired fretwork headboard by West Elm with bedding from Crate & Barrrel. 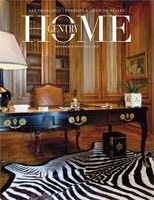 The acrylic base lamps are vintage as is the large framed photo of Elizabeth Taylor. Gray flannel bench is from West Elm. 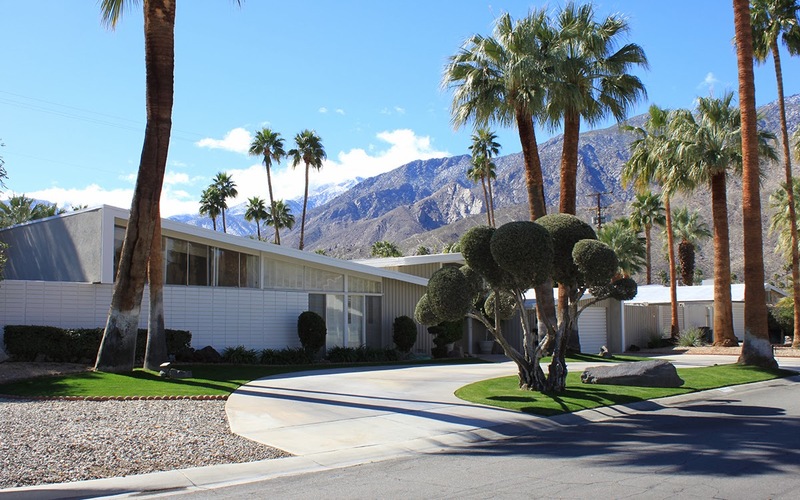 The Palm Springs Modernism movement began originally with custom-residences and hotel designs by the likes of architects Rudolph Schindler, Albert Frey and Richard Neutra. 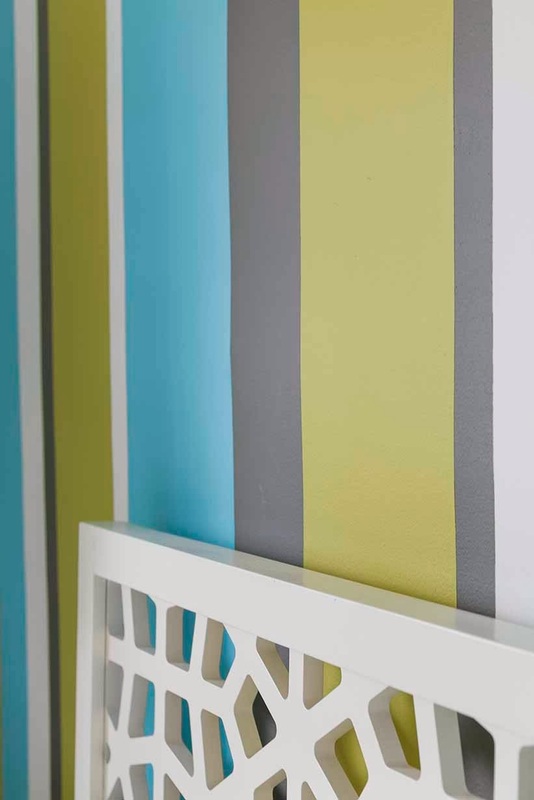 The Alexander Construction Company was founded by George Alexander and his son Robert. 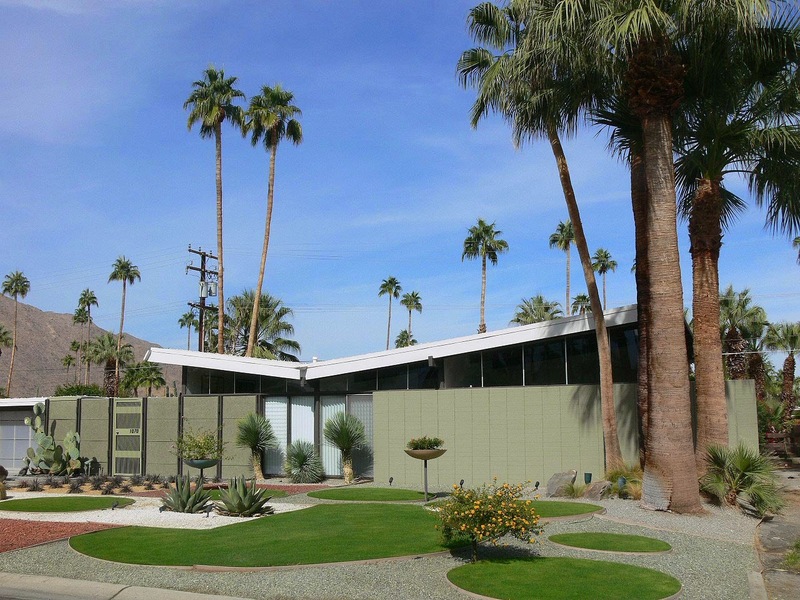 Thirty-four years after Schindler’s first modern home was built in Palm Springs, The Ocotillo Lodge (1956), located in South Palm Springs, was the first collaboration between the Alexanders and architect William Krisel and his partner Dan Palmer — a pairing that over the next few years would redefine the architectural and demographic landscape of Palm Springs residential real estate. 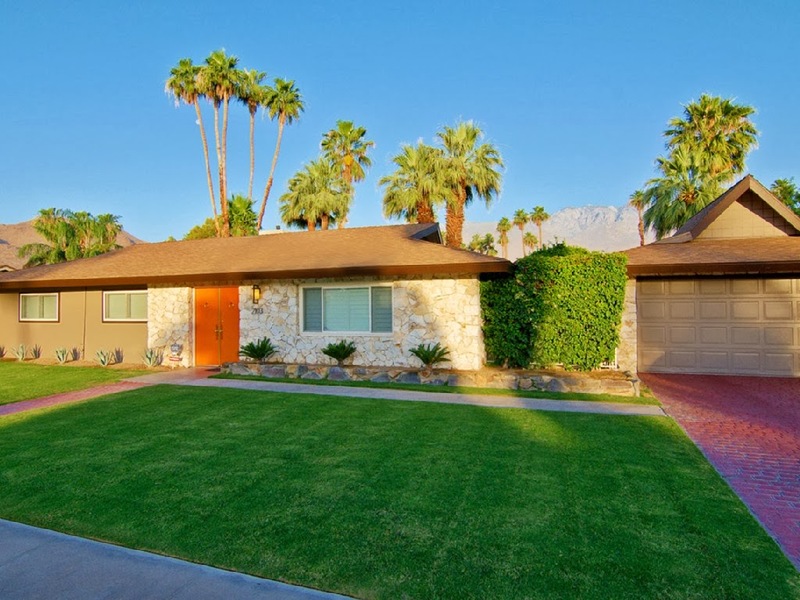 Throughout the 1950’s and early 1960’s, The Alexander Construction Company was important in the Southern California post-war housing boom — especially in Palm Springs. 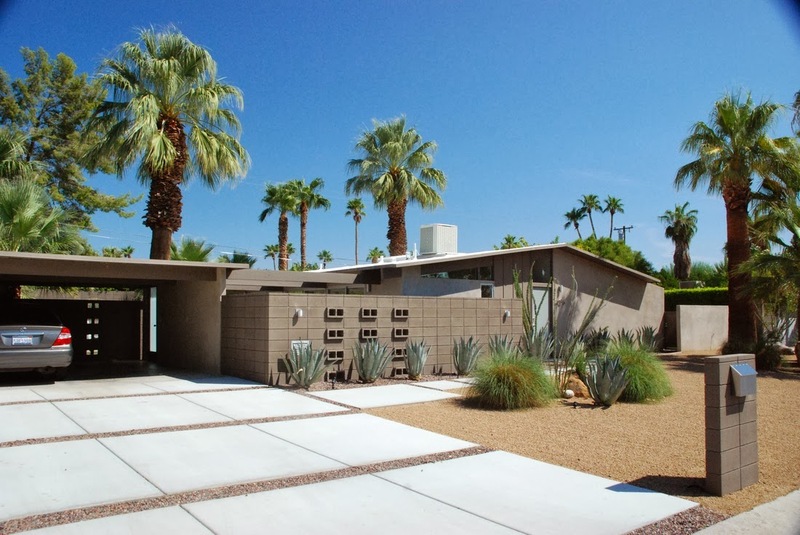 The first Alexander houses were designed for efficiency of production, but in 1957, Palmer and Krisel offered a new concept: to build stylish modern-style tract homes with clean, elegant lines that were affordable and even more efficient to produce. 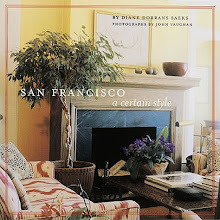 The houses —now known simply as "Alexanders" — were designed to integrate indoor and outdoor living. They sat on large lots with patios and pools, and had high ceilings, post-and-beam construction and wide expanses of glass. 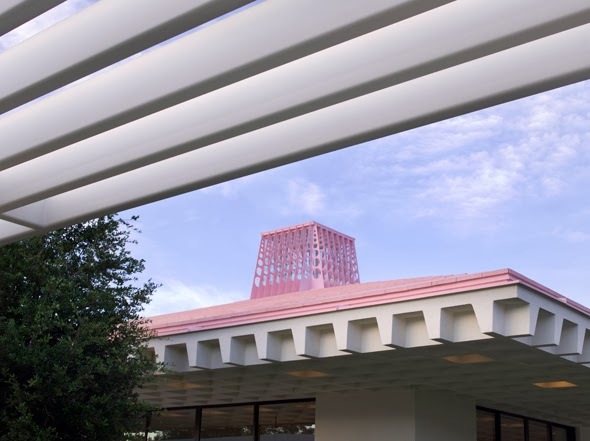 They came in four classic modernist roof styles: butterfly, long gable, folded plate and barrel vault. 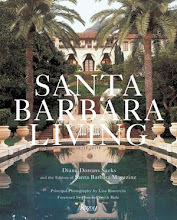 And they were well priced, ranging from less than $20,000 for a 1,200-square-foot house in the Racquet Club subdivision to $39,000 for a 2,200-square-foot in the flashier Vista Las Palmas neighborhood, originally the haven of the “Hollywood” crowd. 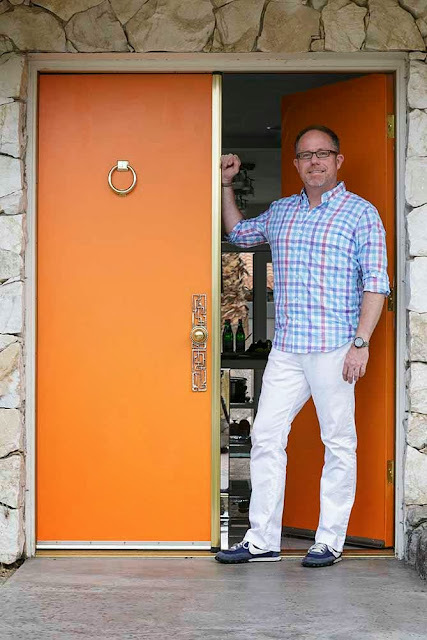 Lead architect William Krisel, who now lives in Los Angeles and is in his eighties, has become a folk hero of mid-century modern home enthusiasts. 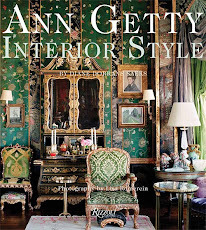 Krisel's complete archive is now at the Getty Museum in Los Angeles. George Alexander and his wife Mildred and their son Robert Alexander, with his wife Helene, were killed on November 14, 1965 on an ill-fated flight from Palm Springs to Burbank. The company ceased operation following the deaths of the principles. In all, 2,500 of the Alexander homes were built — most of them designed by the firm of Palmer and Krisel. These homes set the tone for a modern-to-the-masses building movement. 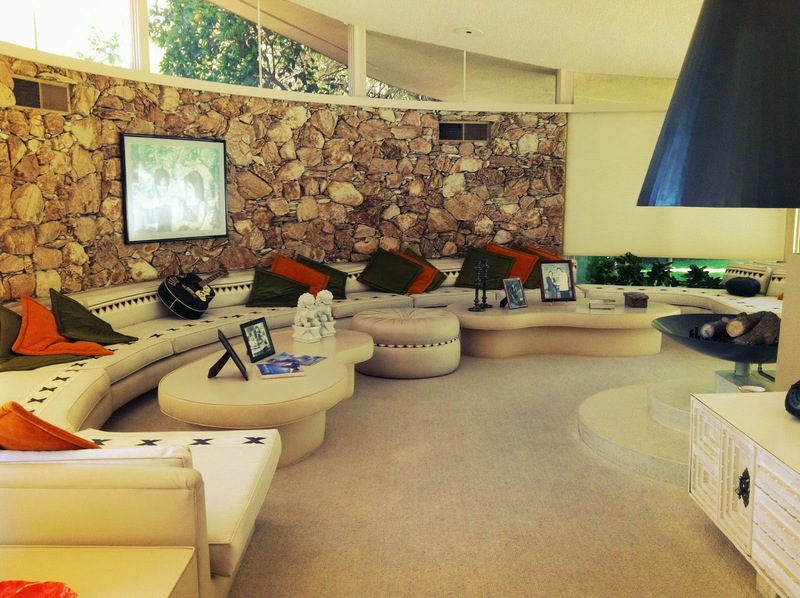 Another well-known Alexander is the “House of Tomorrow” (also known as the "Elvis Honeymoon Hideaway") built by Robert Alexander for his wife in the early 1960s. The house and the Alexanders achieved some level of national celebrity when an eight-page article featuring the house and the family appeared in Look magazine in September 1962. In May of 1967, Elvis and Priscilla Presley spent their honeymoon in the house. 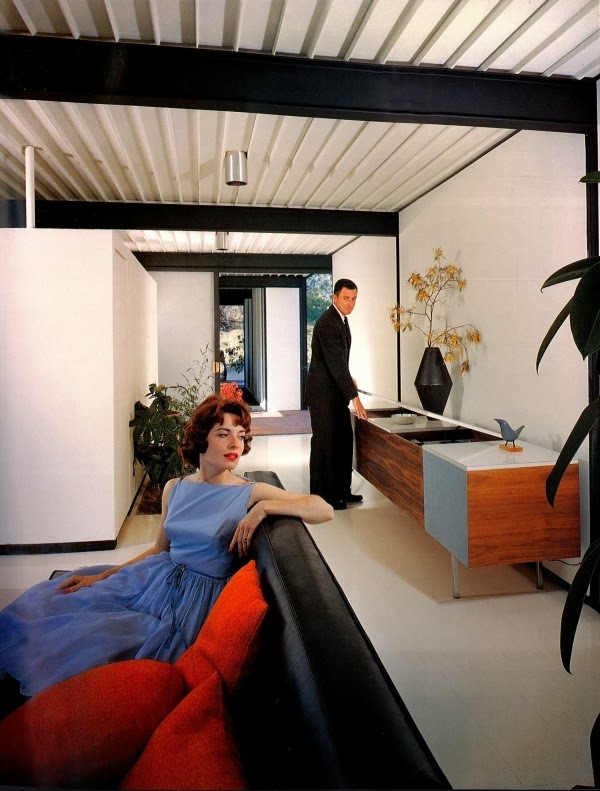 Interior of the "House of Tomorrow." Photo by Brian Dittmar. 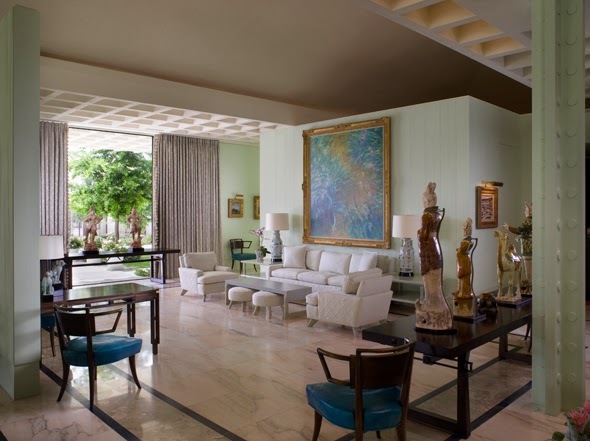 Just south of the heart of the Uptown Design District, this vibrant gallery of Twentieth-Century Design features home furnishings and accessories with eight points of view — each located within small showrooms off the central courtyard, including Palm Canyon Galleria, Bon Vivant, Kelly, Hudson, Griffin, Mr. Cox, and Donald Lloyd Smith Gallery 49. This is a treasure-trove of interesting finds…last time I stopped in, I added to my growing Foo Dog statue collection. 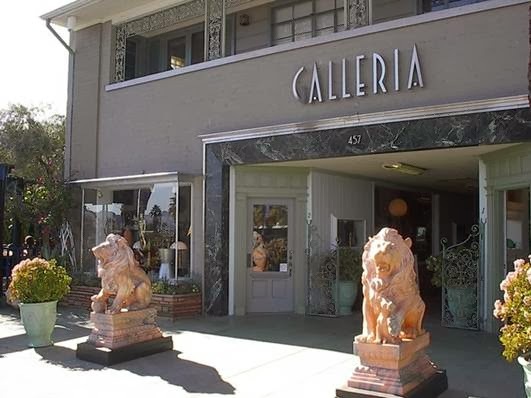 This popular shop on Palm Canyon Drive features an extensive collection of interior décor from mid-century through the 1970s and 80s. 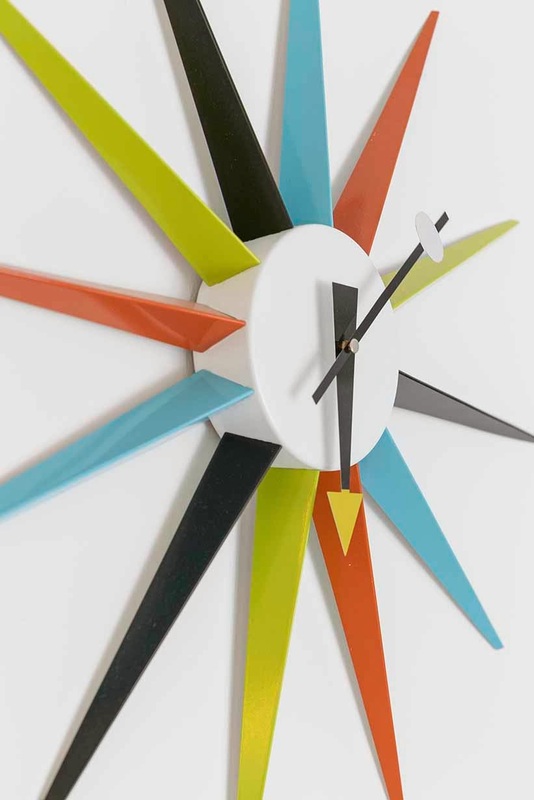 You can find a wide variety of originals by some of my favorite designers such as Paul McCobb, Charles and Ray Eames, Billy Haines, Milo Baughman and Curtis Jeré. I always enjoy stopping in Boulevard to view their unique selection of pristine vintage and new furniture, art, lighting and accessories — it’s a small yet very tasteful collection. 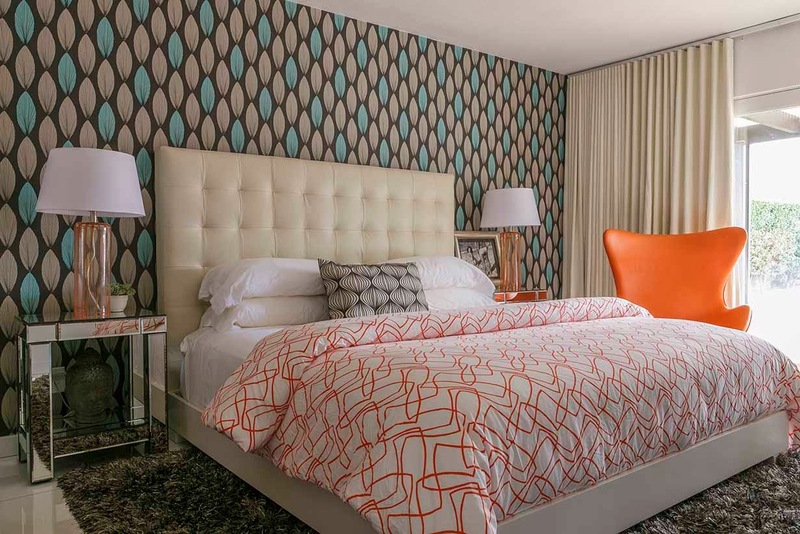 Room Service offers clean, minimal furnishings and accessories with a mid-century modern, Hollywood Regency slant where you could easily create your own version of Kelly Wearstler’s Viceroy Hotel or Jonathan Adler’s Parker Hotel (both are Palm Springs institutions). 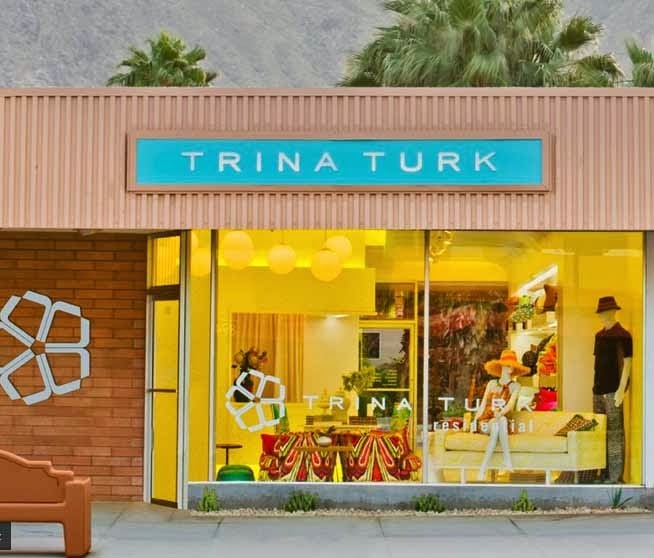 Since 2002, Trina Turk’s original “California Chic” boutique offers a cheerful, chic selection of women’s contemporary ready-to-wear, swimwear, bags, jewelry, and Mr. Turk menswear. An array of brightly colored decorative accessories, boldly patterned pillows, prints, tabletop items, towels, and books can be found next door at the glam home shop. 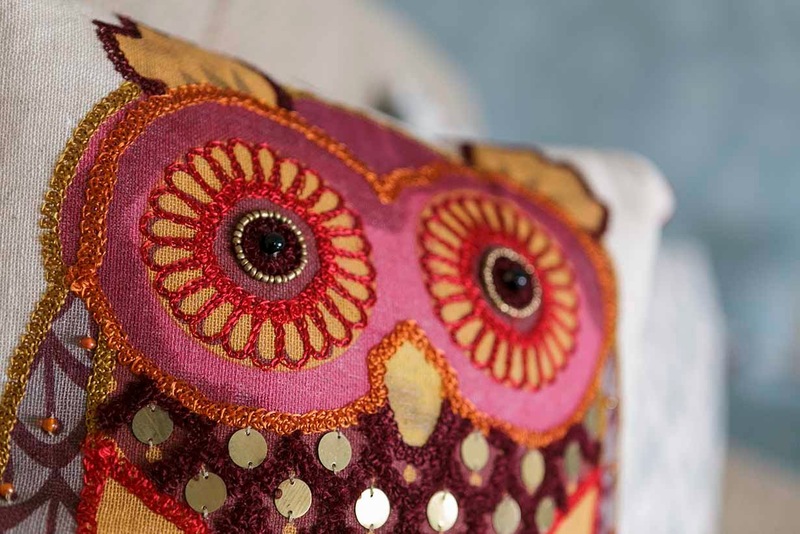 You can’t help but feel like you are escaping to a desert paradise when you browse through this shop. Where Palm Springs shops for gifts, books, home décor, and more. A popular destination known for celebrity book signings, a wide array of gifts and coffee-table books, and the largest collection of Jonathan Adler furniture and accessories in Palm Springs. 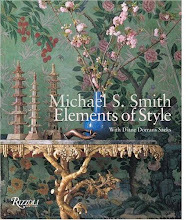 Highlights for the book-lover in me include the Assouline Corners Boutique and the first MoMA Book “Shop in Shop” in the US. Since its debut in 2011, Birba has quickly become a favorite evening haunt. 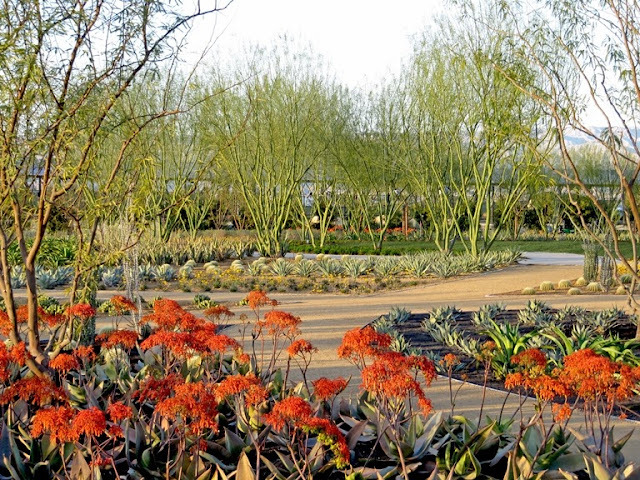 It’s easy to see why: The people-watching — its a “young LA” meets Palm Springs natives, transplants and travelers kind of crowd — is just as good as the food. Pick a spot on the large outdoor terrace (near a heat lamp or firepit on a chilly winter night) and enjoy one of their signature white pizzas (one with rapini, sausage and gorgonzola for me) while sipping a spicy yet refreshing habanero Margarita. The power breakfast offerings at Birba’s sister restaurant include selections from the Bacon Bar or a “Bacon Flight” consisting of slices from savory and spicy to sweet. The flaky, melt-in-your-mouth croissant cinnamon rolls — made in-house every day — are worth the trip. 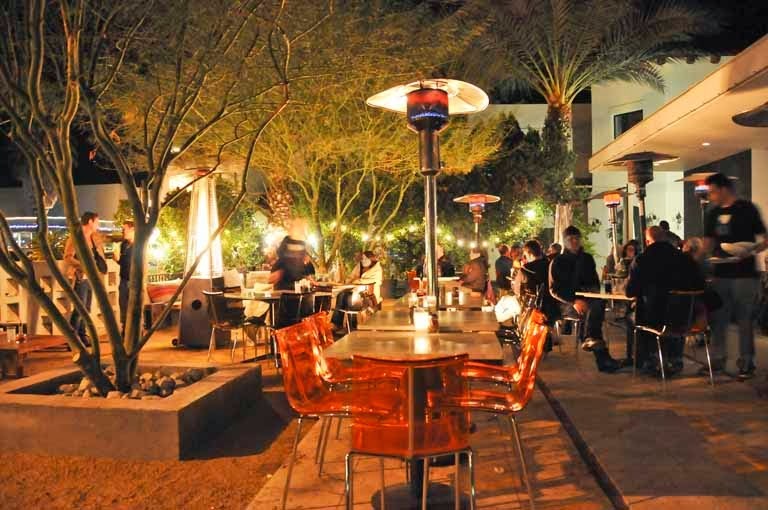 Outdoor seating (in bright orange acrylic chairs) is available for those like me who have dogs or those who simply wish to enjoy the desert climate. This is a good choice for a group weekend brunch. How better to start than with either a Mexi-Mosa (with tequila), a Mali-Mosa (with rum) or a BLT Bloody Mary? The extensive menu consists of comfort foods like scrambled eggs, omelets and French toast, a selection of sandwiches and even a salad flight. The patio at Jake’s is a highly desirable place to dine al-fresco and enjoy the warmth of the desert sun. 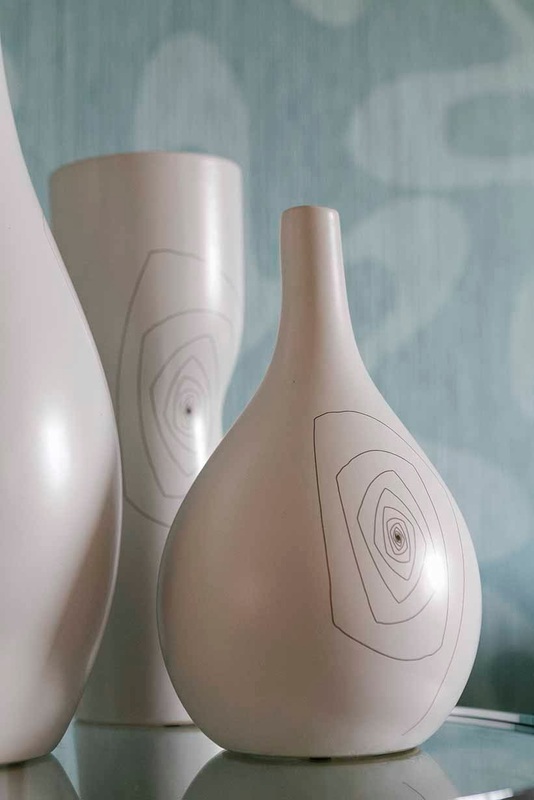 I love the interior design and architecture of Palm Spring’s newest dining hot spot. 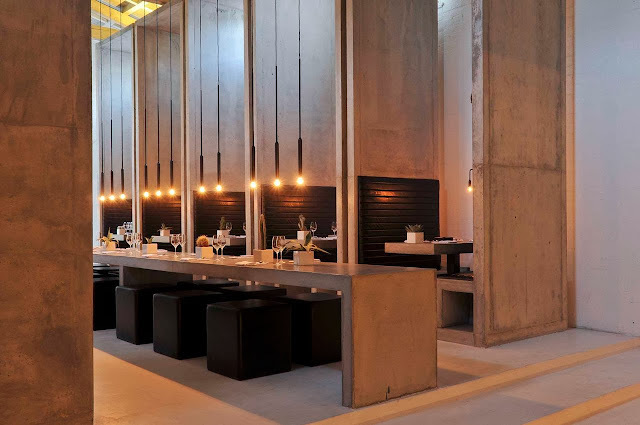 New York City-based Soma Architects fitted out a colonial building — with its soaring cathedral ceiling and high windows — with concrete volumes and black steel and leather bunker-like booths (ideal for intimate dinners). 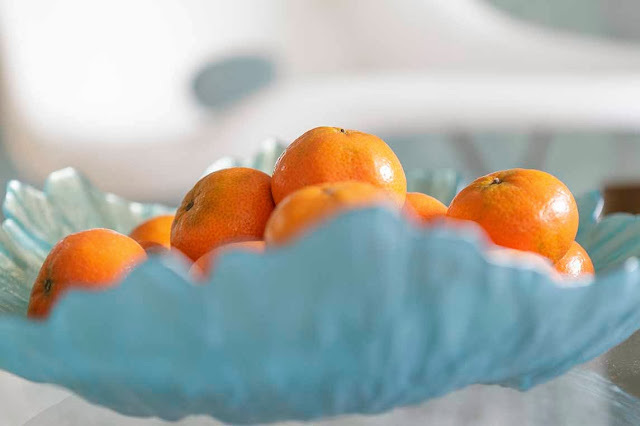 It’s the perfect setting for the thoughtfully-executed, locally-sourced seasonal fare. For Fall, think baby back ribs with grilled sweet corn salad or their famous burger made with oxtail and served with mushroom marmalade and truffle pecorino cheese — some of the dishes my friends and I enjoyed there last month. I love feeling like a Palm Springs local and always enjoy the best coffee in the valley at Koffi ’s flagship location. A larger location has now opened in South Palm Springs across from the ACE Hotel, which is also a great place to enjoy an iced cappuccino in the desert heat. 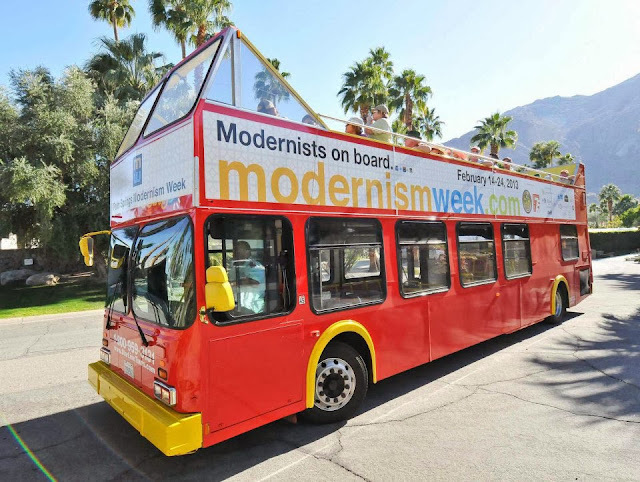 Modernism Week — February 13–23, 2014 — is a 10-day celebration of mid-century architecture, design and culture. Drawing a crowd of more than 40,000 people last year, this is the only such event in the country and has helped fuel a robust national interest in the preservation and appreciation of modernism. In 2006, following the success of both the Palm Springs Modernism Show and the annual symposium organized by the Palm Springs Art Museum’s Architecture and Design Council, a group of local design and architecture aficionados created Modernism Week’s signature event in February to showcase the world-renowned mid-century modern architecture of Palm Springs. 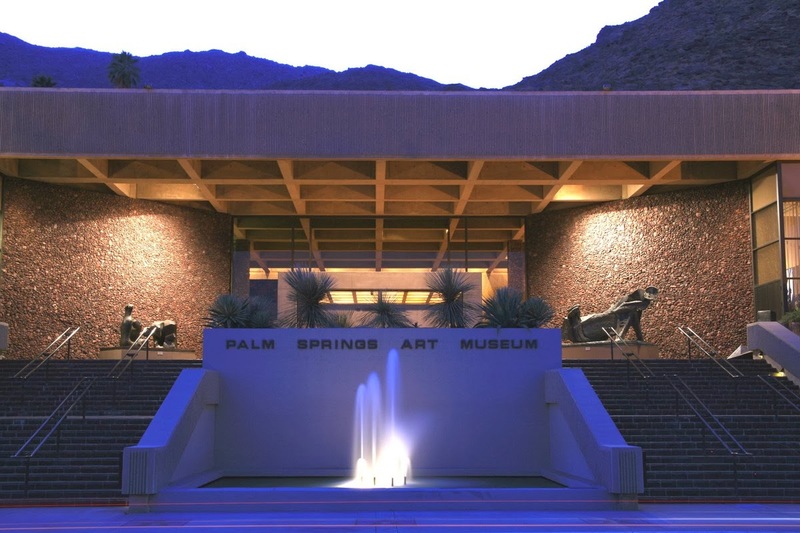 Located in downtown Palm Springs, the Palm Springs Art Museum features a collection of art, loaned or donated by the area's residents. 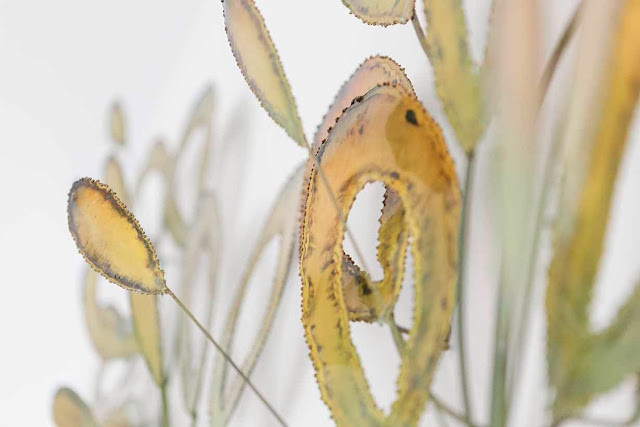 The museum includes works from Marc Chagall, Pablo Picasso, Andy Warhol, Roy Lichtenstein, Donald Judd, Helen Frankenthaler, Louise Bourgeois, Alexander Calder, Henry Moore, Robert Rauschenberg, Antony Gormley and Ansel Adams. 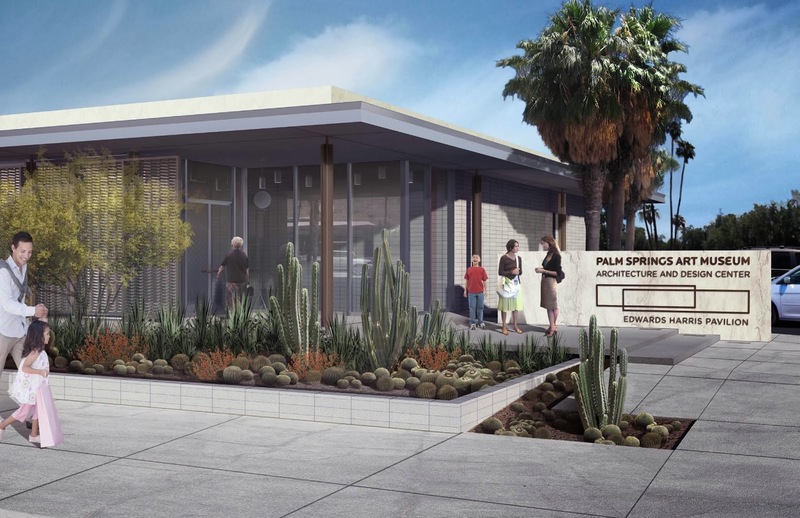 An Exciting Expansion for Midcentury Design: The Palm Springs Art Museum recently purchased a historic 1961 bank building in downtown Palm Springs and is in the process of rehabilitating the iconic building to create the new Palm Springs Art Museum Architecture and Design Center, Edwards Harris Pavilion. 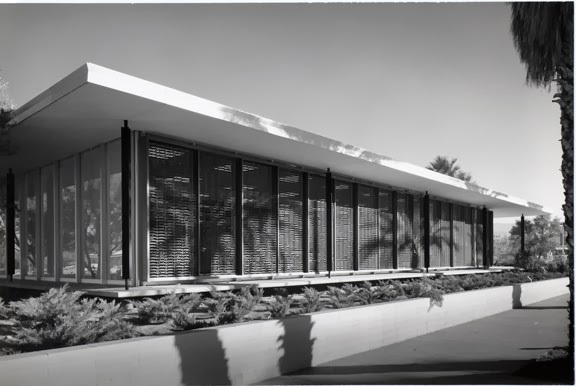 Marmol Radziner Architects of Los Angeles, architects renowned for their restoration of two of the most significant homes in Palm Springs, the Kaufmann House and the Ship of the Desert, are working with the museum to create develop the floor plan and overall design restoration of the building, which is a classic mid-century international style structure, and was recently designated as a protected Class I Historic Site. Situated in a prominent downtown location at the southeast corner of Palm Canyon Drive and Baristo Road, it features a ground level glass pavilion space that will showcase architecture and design exhibitions and curatorial offices. When completed, the A&D Center will be the country’s first historic structure to be transformed into a free-standing architecture and design museum that is housed in a modern building. 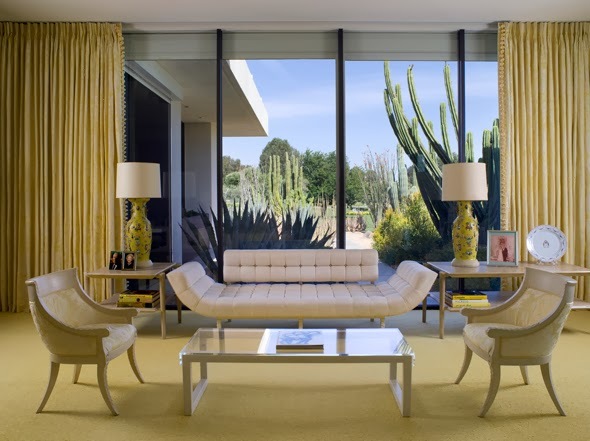 In the mid-1960s, Walter and Leonore Annenberg hired Los Angeles-based architect A. Quincy Jones (1913-1979) to create a midcentury modern residence in Rancho Mirage. 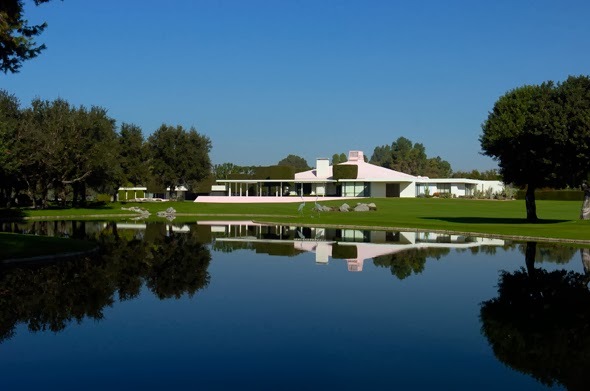 Jones, who for many years was dean of the School of Architecture at the University of Southern California, was known both for designs that integrated houses into the landscape and for "statement roofs." 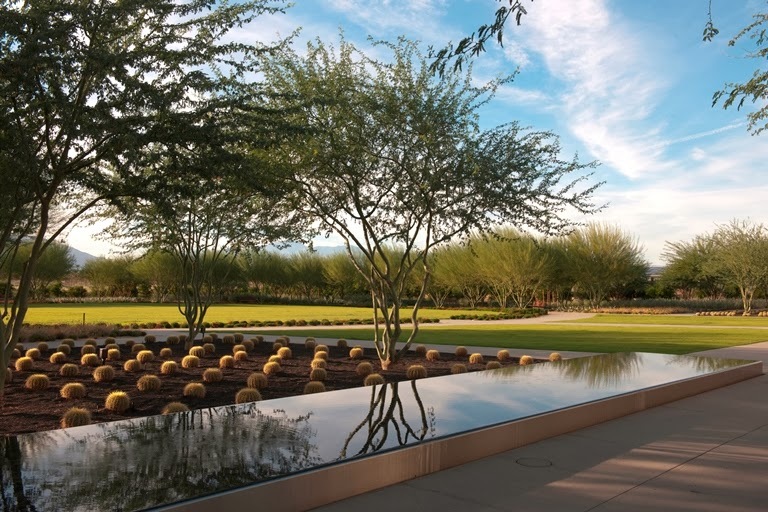 His signature style is evident at Sunnylands, where he used overhangs to shield the interiors from the direct sun, plus walls of glass to allow the climate's brightness to fill the rooms. 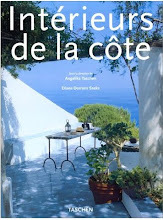 Leonore Annenberg's deep love of flowers and nature is reflected in the cactus and rose gardens that abut the house and terrace. Interior rooms flow into each other with the same open expansiveness as the surrounding landscape. 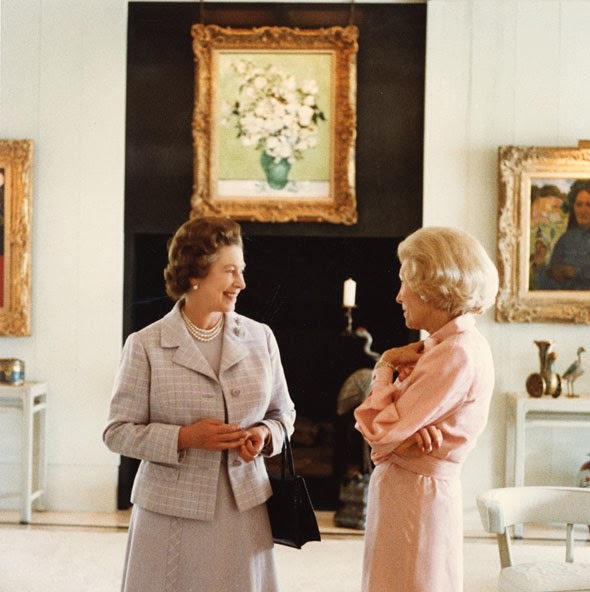 The interiors were designed by William Haines and Ted Graber, known for decorating the Reagan White House and for popularizing the Hollywood Regency style. 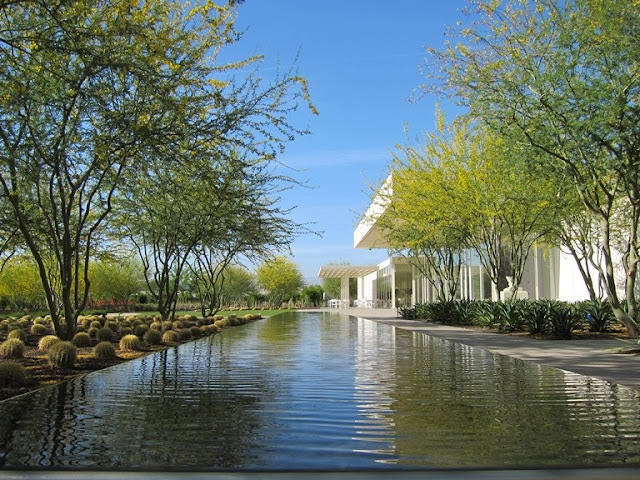 Many key figures of the 20th century enjoyed relaxing as guests at Sunnylands. 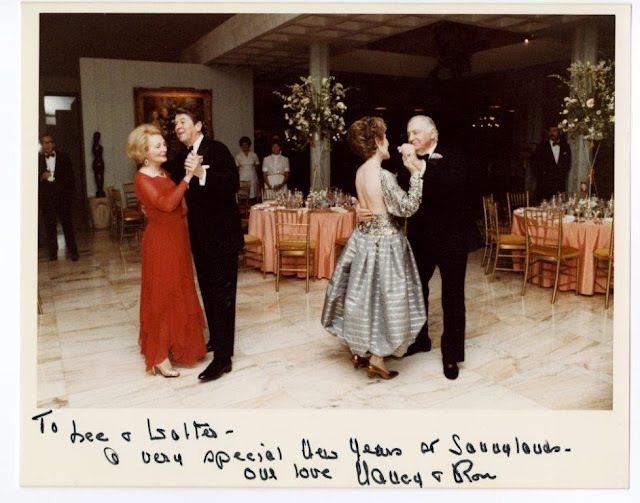 The list includes seven U.S. presidents, the British royal family, and Hollywood icons like Bob Hope, Frank Sinatra, Jimmy Stewart, Ginger Rogers, and many others. The Annenberg tradition of being gracious hosts and extraordinary philanthropists extended to their final gift of Sunnylands to the public. The Sunnylands Collection The Annenbergs left all but their Impressionist and Post-Impressionist painting collection at Sunnylands including works by Yaacov Agam, Harry Bertoia, Jean Arp, Emile Gilioli, Pablo Picasso, Jacques Villon, Andrew Wyeth, Romare Bearden, and Jean Fautrier. All photos: © The Annenberg Foundation Trust at Sunnylands. 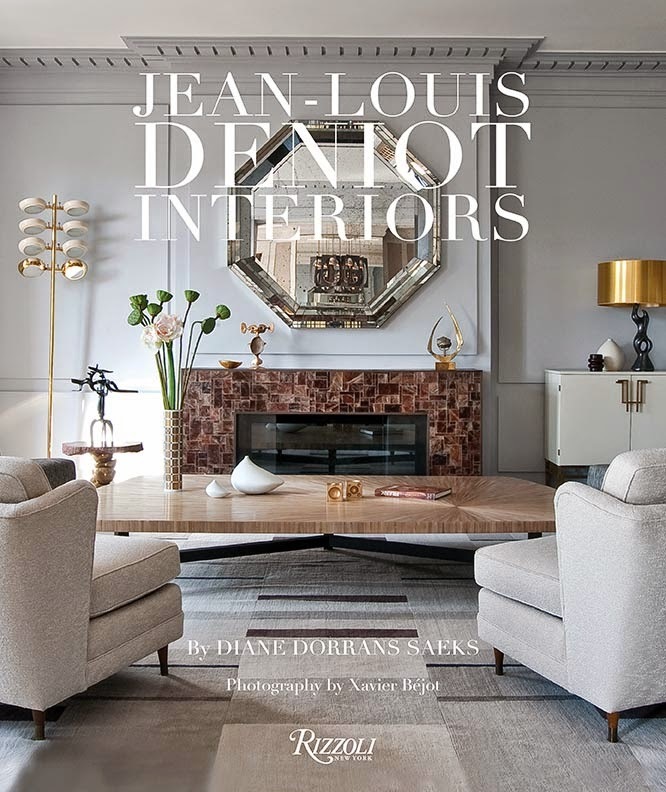 With richly details text, and insider information about residences, people, characters, and iconic designs, this book also features photography of the legendary Modernist houses by Richard Neutra, Albert Frey, and many others. 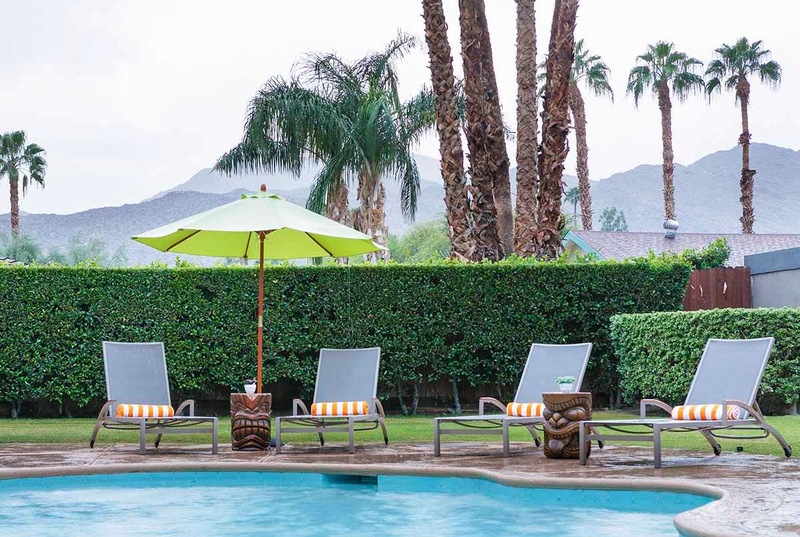 There is also the dramatic setting of Palm Springs and Palm Desert: swimming pools and private terraces set in rocky hillsides, desert evenings with the hills turning pink, and the dramatic mountain backdrop. 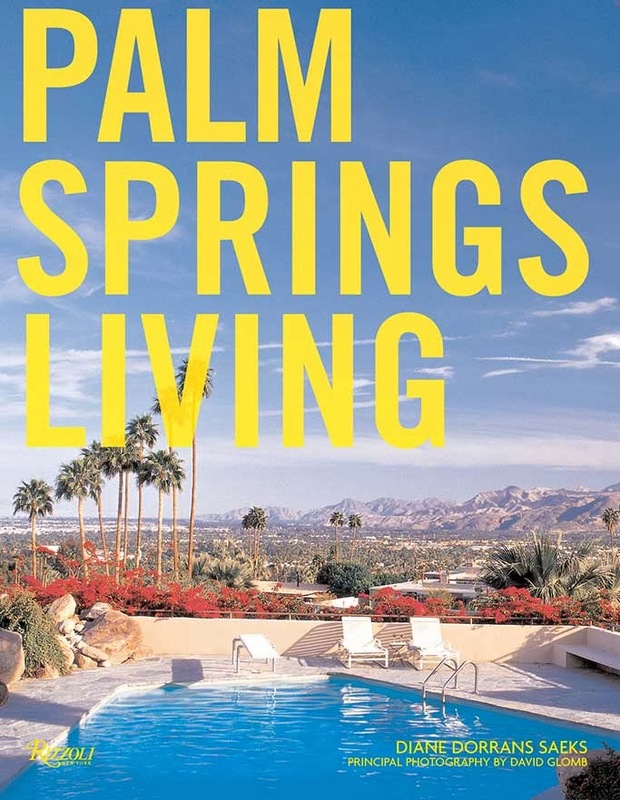 Ultimately, Palm Springs remains a livable fantasy–the sun always shines and the architecture and interiors, unbound from winter’s cold blasts and the workaday world, offer a vision of the stylish life. 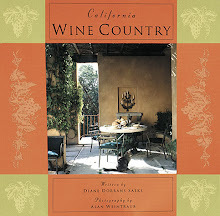 It’s the definitive book, highly collectible. Congratulations Brian on a beautiful project. I appreciate the history lesson as well. What a fun project! Congratulations Brian! Love the front door hardware, and thanks for all the additional info and Palms Springs shopping sources.